OMG MAKE ME ONE NOW!!! 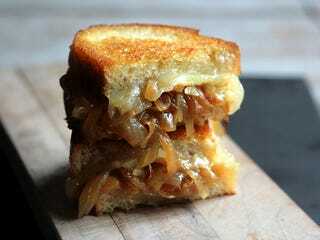 French Onion Soup Grilled Cheese. This is a real thing, people! I have a need for one. Too bad the store is closed. I'm going to have to find some gruyere to make one of these. After finding the picture, and passing out from desire, I did a little research and discovered this isn't something new. There are recipes all over Google for this. But I don't care! It's new to me, and I must needs have one as soon as it is humanly possible to obtain one.